NoroPraz Horse Wormer is for the treatment of mixed cestode and nematode or arthropod infestations due to adult and immature roundworms, lungworms, bots and tapeworms in horses. 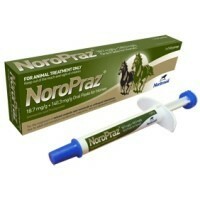 Supplied in an easy to use calibrated syringe, NoroPraz Horse Wormer can treat horses up to 700kg (or two ponies weighing less than 350kg each) and has been given a delicious apple flavour for added palatability. Each 7.49g syringe contains 18.7mg/g Ivermectin and 140.3mg/g Praziquantel. It is important that you read the product datasheet before administering this product and that you use the product only as detailed within.